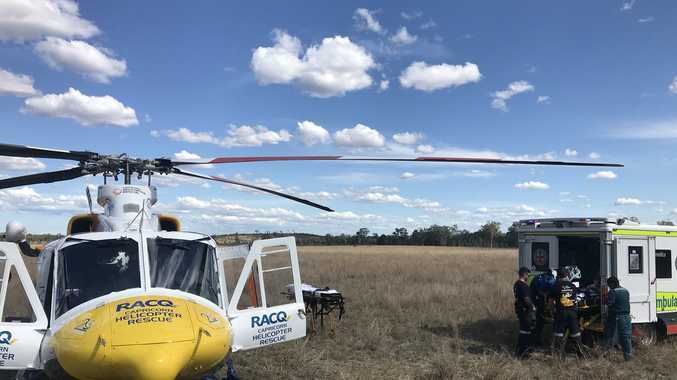 Rescue 300 is returning from a property approximately 50km North of Rockhampton, transporting a patient who was involved in a vehicle accident. UPDATE 4.20pm: QUEENSLAND Ambulance were unable to provide any more detail regarding the injuries suffered by the 70-year-old man who crashed into a tree today. They said RACQ Rescue Helicopter was confirmed to have arrived at Rockhampton Hospital with the patient at 3.15pm. UPDATE 2.15pm: RACQ Capricorn Helicopter Rescue have touched town at the crash scene to take an injured man to hospital. A spokesperson from QAS stated the man was in a stable condition. BREAKING: PARAMEDICS rushed to a crash north of Rockhampton this afternoon where a man was injured after reportedly hitting a tree. Crews were called to Canoona, around 45km north of Rockhampton around 1.20pm where a person was reportedly trapped inside the vehicle. On arrival at the Atkinson Rd crash, the man was still inside the vehicle with a gash to his head.